If you are looking for new barstools for your restaurant or café, consider the Spanish inspired Seville barstool. Are tired, worn out barstools bring down the atmosphere? Elevate your bar seating, sushi den, café or even your coffee house or wine bar with the clean, modern lines of these designer commercial barstools. 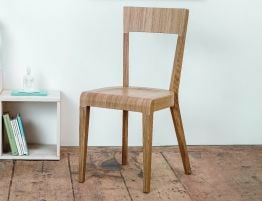 The Seville solid Oak commercial barstool is a strong example of what you can achieve when you pair quality materials, like oak with exceptional design. 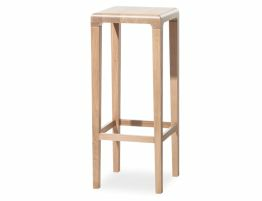 This solid wood restaurant barstool, seen here in natural finish, might just be the perfect fit for your restaurant bar seating, coffee house, bar or café. The Seville restaurant bar stool is the work of European fine furniture crafters, TON CZ and established German design collaborators Ronny Eysser and Alexander Grimm. This backless wooden bar stool takes as its inspiration the stepped and terraced areas of Seville, Spain, and its namesake. The Spanish province of Seville is a well known wine producing region with its many steps, terraces and climate and that provided inspiration to designers Eysser and Grimm. Perhaps they knew that with wine flowing so easy in Seville, that what people really needed was a beautiful barstool from which to enjoy the many Seville varieties of vino. Put this inspired and inspiring designer commercial barstool in your establishment for a striking, upscale modern look. 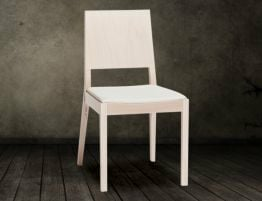 We offer a number of style, size and colour options to make finding the right commercial barstools and commercial dining furniture a no-brainer. We have options for every business and every budget to help you make your space everything you know it can be. Our design team values many things about the Seville solid wood restaurant barstool, chief among them this commercial bar stool doesn’t look anything like the cookie cutter wood stools that seem to flood the market .The Seville barstool is upscale and very well constructed. 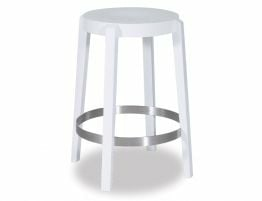 Put this commercial barstool in your establishment and it will elevate the design without taking attention away from service. Because of the quality solid beechwood construction, these barstools are built to last and will stand up to heavy use. Great commercial interior design doesn’t have to cost a year’s profits. Making your restaurant interiors pleasant and welcoming can have a major impact on your bottom line.